Scroll down to visit the photo gallery of the flora in this habitat. 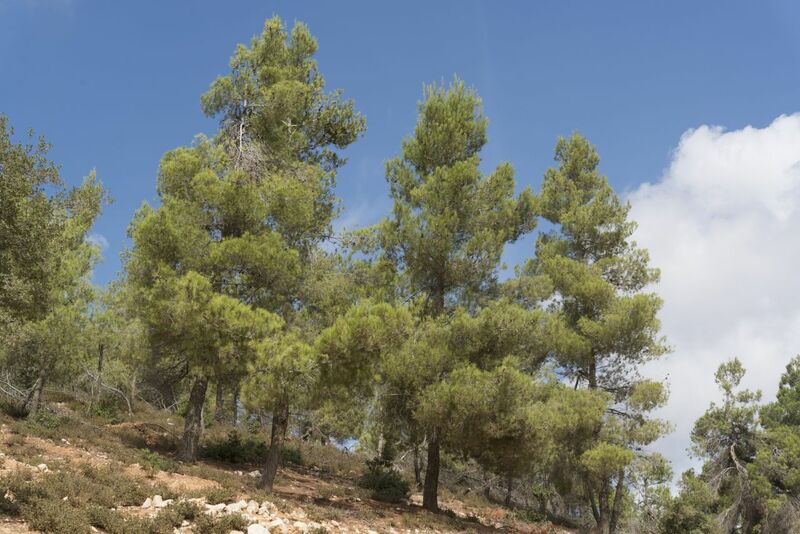 The RBG selected the last remaining stand of old pine forest in Jordan, and the southernmost native Pinus halapensis forest in the world, to serve as a home habitat for the Pine Forest Habitat. 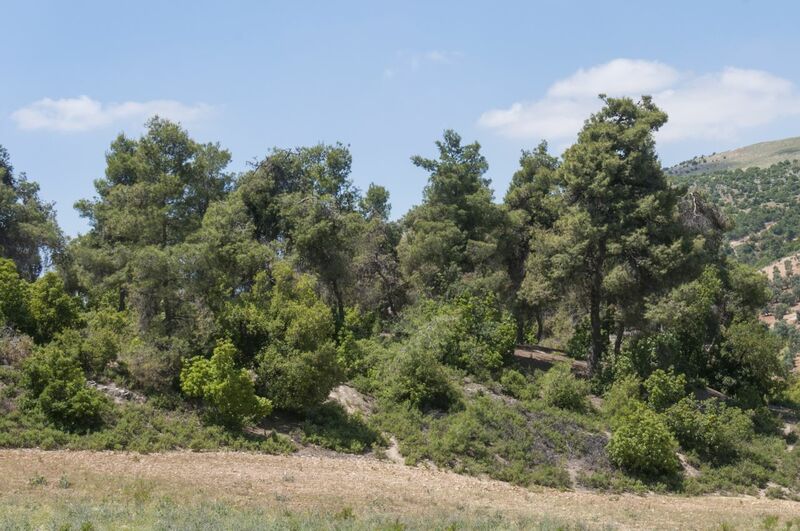 The model site is located directly across the Zarqa River valley from the RBG, within the Dibeen Forest Reserve, an area of over 8 km2 administered by the Royal Society for the Conservation of Nature. The soils and geology in the home habitat are almost precisely the same as in the RBG. The climate is also similar, although higher elevations bring colder winter conditions. The forest is mostly mixed oak (Quercus calliprinos and Q. infectoria) and pine, and the mix varies by elevation, though P halapensis is dominant throughout. 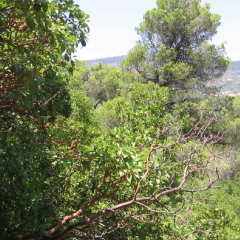 Mixed throughout are also the strawberry tree (Arbutus andrachne), Palestinian pistachio (Pistacia palestina) and wild olive (Olea europaea). Dibeen especially attractive as a model habitat due to the relatively healthy understory. The scarcity of intact native habitats is a theme that ran throughout our search for model habitats. Jordan has been so deforested and so desperately overgrazed for so long that even our most beloved forests are still mainly trees and bare earth. 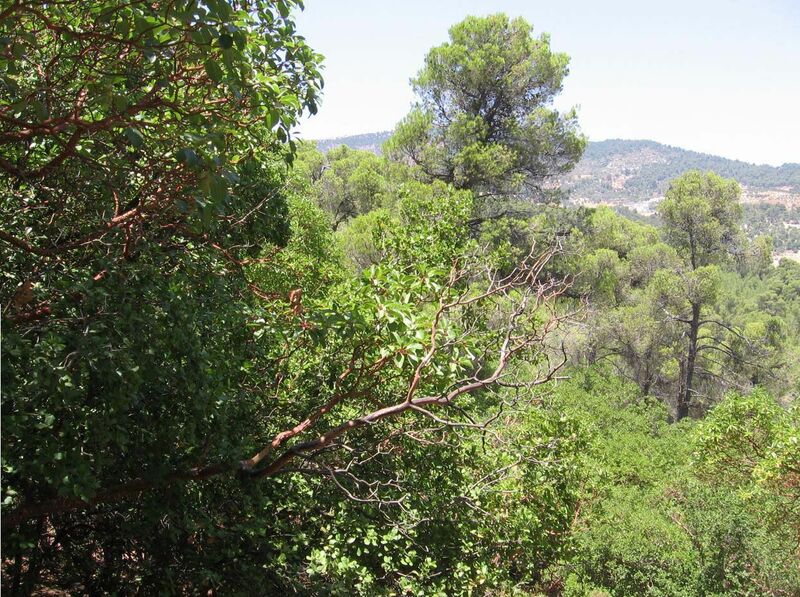 Again and again, the RBG team called national experts regarding Jordanian flora and forests, only to be sent to groves of trees – sometimes even only an isolated tree – surrounded by barren hillside or farmed land. Even within the reserves, most of the land is appallingly overgrazed. 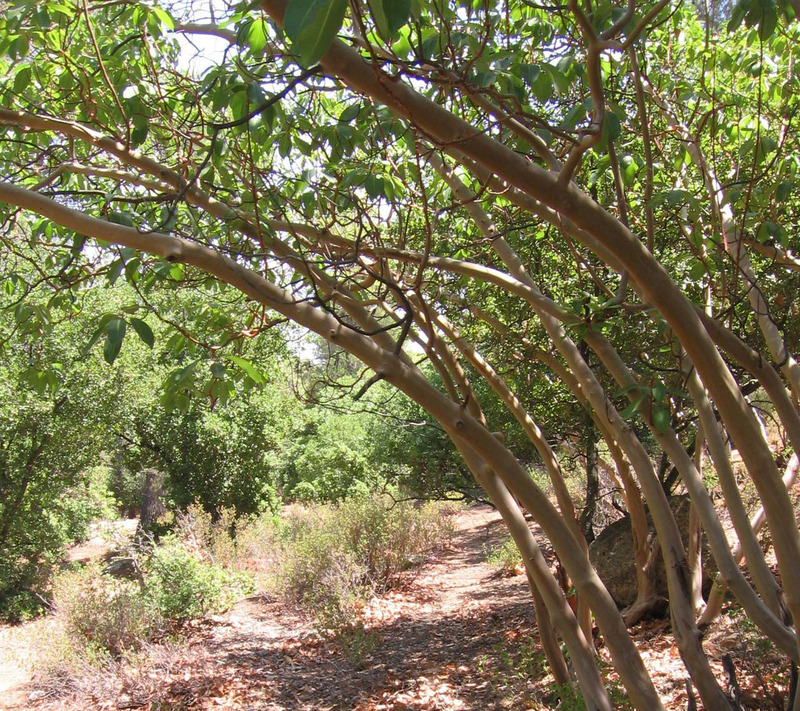 The pervasive presence of Cistus creticus, Cistus salvifolius and Sarcopoterium spinosa are indicators of forest degradation, fire and soil degradation respectively. These, however, are balanced by the rise of such indicators of forest health as Cephalanthera longifolia, Limodorum aborytivum, Ophrys transhyrcana, Orchis anatolica, Orchis tridentata, Orchis sancta, Anacamptis pyramidalis, and Neotinia maculate. In the gallery below, you'll find pictures and information for some of the plant species in our Pine Forest Habitat. More entries will be added over time. For a list of the key plants that will make up the habitat, click here. Jordan's last remaining stand of old pine forest, found in Dibeen, is the home habitat for our Pine Forest Habitat.